I made this ATC some time ago and got traded but I found another one that was in my stash. We all have stashes and you never know what you will find and when. 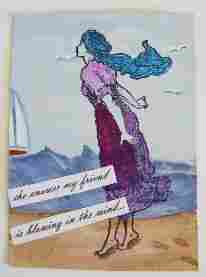 The new challenge over at Inkurable Stampers is by the sea. I thought I would enter this card and see if I have a chance at winning something. Most of the ATC is painted free hand, even the sailboat I came up with without even a line drawing to go by. I was a bit out of my comfort zone but how hard is it to draw a couple of triangles? LOL The young girl is stamped and painted with acrylic paints. Who may it be on the sailboat? is it someone she loves that has left? someone coming to greet her?
" The answer my friend is blowing in the wind". I love this one! You should win something for sure. My next birthday card should be this image. You are awesome! this is lovely les, she looks excited to see someone thats for sure! !jenxo good luck too!! & Good luck with the Challenge!